Are you new to Microsoft (MS) Graph or need some help getting started with your hackathon project? Throughout the month of November 2018, during their 30 Days of Microsoft Graph series, Microsoft posted daily articles aimed to introduce developers to Microsoft Graph (there are 30 total!) Each of these articles contains content that covers 0-level to 200-level topics. Each post should take you 5-15 mins to read and try out the sample exercises. No prior knowledge of MS Graph is required. Microsoft’s hope with this segment was that beginners will quickly pick up the content and that experts will also learn a few new things. Each post and exercise was curated by a collection of Microsoft FTEs, MS Graph product group members, and MVPs. In preparation for the blog series it is recommended to install the following tools. The blog post announcing the 30 Days of Microsoft Graph series, contains a link to each article/day in the series and a link to the GitHub repo with exercises, along with some other great info!  Check it out to get started and get a jump-start on your Microsoft Graph Security Hackathon project! Happy building and happy holidays!